In January, when we’re in the midst of planning our gardens, skimming through seed catalogs, and just starting to poke the first of our seeds into trays it can be easy to forget about the hardships of gardening. This time of year it’s easy to picture a perfectly maintained garden but the reality is the weather we wait for and cherish to make our crops grow is the same weather that brings the jungle of weeds. 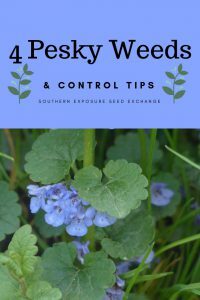 Here’s a bit of information on five of these pesky weeds and some tips for managing them in your garden. Also known as creeping Charlie, ground ivy is a perennial that has sprawling vines with tiny purple flowers and clusters of heart-shaped, scalloped leaves. Each cluster of leaves also has a node which develops roots making it even harder to get rid of. 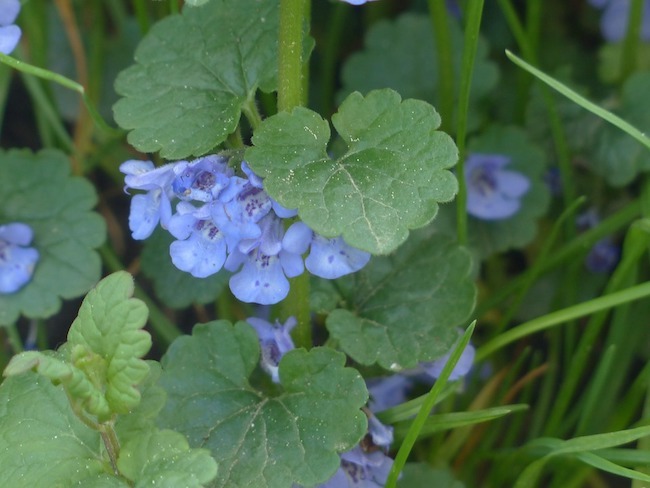 Though it’s now, mostly looked upon solely as a nuisance, ground ivy can be used in beer making, herbal medicine, or in the place of rennet in cheesemaking. As ground ivy is full of vitamin C it was once used to treat scurvy and can now be made into a tincture or tea to help ease colds. In beer making it was traditionally used in the place of hops to add a bitter flavor to beer and help preserve it. While every situation is different ground ivy can be indicative of having heavy, wet soils. It generally loves moisture. Continuing to add organic matter to your soil each year and avoiding compaction can help reduce the spread of ground ivy. Crabgrass gets its name from its growth habit. Many believe its low, spreading form resembles an actual crab. It’s a tough annual that will tolerate a lot of foot traffic and can go to seed even when it’s cut short. One of the best things you can do to rid your garden of crabgrass is just staying on top of it. As an annual, you can prevent crabgrass from coming back next year by not allowing it to go to seed. Using no-till practices can also help you avoid bring old seed to the surface while turning over your soil. 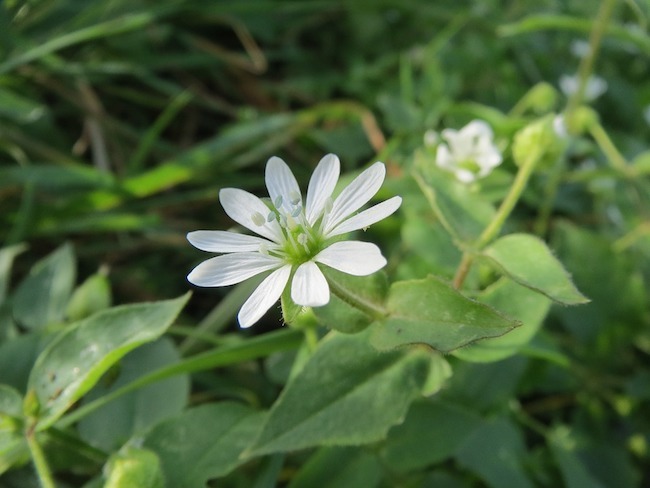 Another low-growing annual, chickweed has oval opposite leaves and small white flowers with 5 lobed petals. It does better in cool moist weather so it’s typically an issue in the spring and early summer. It has been used medicinally to treat a variety of ailments. It is believed to have anti-inflammatory properties and is sometimes crushed and used to soothe irritated skin. Used internally it’s believed to help with cramps, arthritis, and digestive issues. Chickweed is nutrient dense and great for people and livestock. It’s high in iron as well as vitamins A, C, and D. Adding it to your salads and feeding it to your chickens might help you keep this weed in check. Bermuda grass is a super tough perennial grass that spreads quickly and forms a dense mat making it popular for lawns, pastures, and sports fields and dreaded by gardeners. It spreads by seeds, runners, and rhizomes and its roots can grow up to 6ft deep. It’s sometimes called, devil’s grass and rightfully so. It can be one of the hardest weeds to combat and it will likely take a long term approach to eradicate from your garden. First, avoid tilling your soil. This brings seed to the surface and breaking up pieces of Bermuda grass will result in each piece sprouting. Use a thick and continuous layer or mulch and be vigilant around plants. One of the best weed management techniques is also one of the easiest, mulch! Laying down layers of cardboard or newspaper and covering them with leaves, straw, grass clippings, or wood chips can smother all kinds of weeds. Many people use plastic but with its economic and environmental costs, it probably isn’t worth it for the small gardener. As mentioned previously using no-till agriculture can also help prevent weeds and improve the soil. Planting a fast-growing cover crop like buckwheat can sometimes out-compete weeds and break the cycle helping you get on top of things. Flame weeding can be a great option to ensure beds are as weed free as possible before direct seeding small crops like carrots and lettuce. Unfortunately, you do have to purchase a flame weeding tool as well as propane which isn’t ideal from an environmental perspective. Invest in quality tools. It’s so much easier to keep up with weeds using a wheel hoe or even a stirrup hoe than it is by hand. Especially, if you have an abundance of one type of weed it’s probably time to get a soil test. Sometimes weeds are nature’s way of telling you your soil has a nutrient or pH issue. Learn more about soil tests here. What are your problem weeds? Have you found a good, organic solution to weed management?